These tender and irresistible muffins work nicely during any season. I find myself craving them often during late summer-- just before Fall hits--as they are a nice transition recipe from warmer to cooler temperatures. If you cannot find black walnuts, traditional walnuts or pecans can also be used in place of them; or you can omit them altogether. In a very small bowl, whisk together the 2 tablespoons flaxseed meal with the 4 tablespoons water and allow to rest about 5 minutes, or until gelled. Prepare 12 standard sized muffin cups by lining them with paper liners or by lightly greasing. Preheat your oven to 350 °F. In a large mixing bowl, combine the granulated sugar, pumpkin pie spice, cinnamon, baking soda, and sea salt. Mix well and then add the prepared flaxseed meal, canned pumpkin, and olive oil and mix well using a sturdy whisk until the mixture is well combined. Gradually add in the flour, a little bit at a time, until all has been incorporated. Fold in the chopped apples and walnuts and then let the batter rest 5 minutes. Drop about 1/4 to 1/3 cup of batter into each prepared muffin cup, dividing evenly among 12 cups. In a small bowl, combine all of the ingredients for the topping using either a fork, or by quickly mixing with clean hands until medium-sized crumbles form. 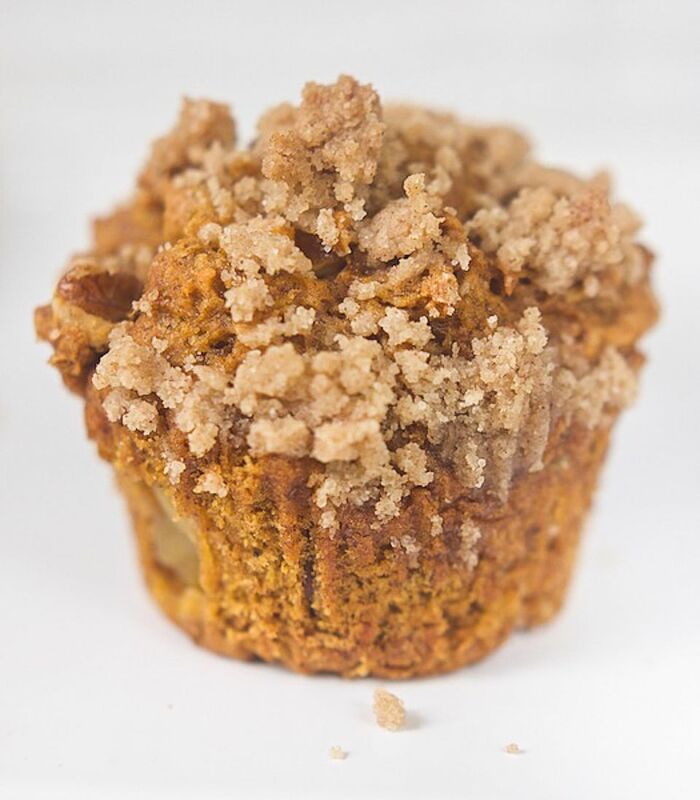 Lightly sprinkle the crumble topping over muffins until all the topping has been divided evenly among the muffins. Transfer the muffins to the middle rack of your preheated oven. Bake the muffins in preheated oven about 30 to 35 minutes or until knife inserted in middle comes out clean. Serve warm (my favorite way to enjoy them) or let cool and enjoy at room temperature. Store the muffins up to 4 days in an airtight container at room temperature. You can also freeze the baked muffins by placing them carefully into a freezer safe container for up to 3 months. Thaw by baking at 350 ºF for approximately 10 minutes, or until no longer frozen.